A warming body scrub that exfoliates dull, dry surface cells to reveal soft, glowing skin. The Method: Body Polish is a warming dual-action body scrub that buffs away dry surface cells to reveal fresh, glowing skin. Super-fine Mineral Crystals and Salicylic Acid work together to help improve the look of skin's texture and radiance. A blend of nourishing African Marula Oil and Kigelia Fruit Extract, rich in essential fatty acids and vitamins, keep skin soft and supple. This luxurious formula is also infused with Zeolite, a natural mineral that creates an invigorating warming sensation activated by water. With one use, skin feels smooth and visibly rejuvenated. The first step in The Lancer Method for Body, this warming body scrub contains both physical and chemical exfoliants to reveal smoother, softer skin. An extension of Dr. Lancer's original Method, this three-step skincare regimen formulated for the body is your shortcut to an all-around youthful glow. 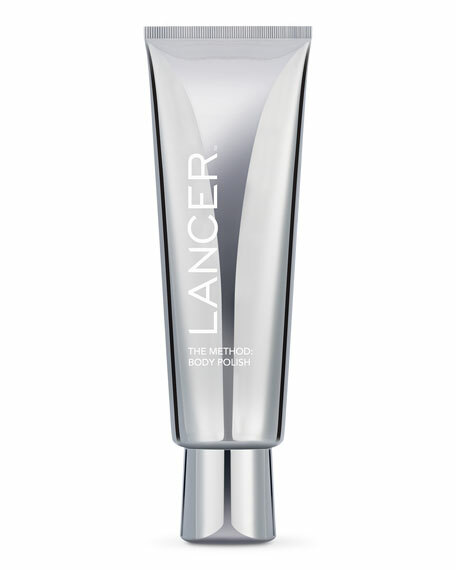 Polish, Cleanse and Nourish with Lancer Skincare's innovative formulas to achieve A-list radiance from head to toe. Massage a generous amount onto dry skin using firm, circular motions. Rinse off with warm water and follow with The Method: Body Cleanse (sold separately). EG-8, Glycerin, Alumina, Sodium Bicarbonate, Butyrospermum Parkii (Shea) Butter, Oleth-20, Trihydroxystearin, Silica, Glyceryl Stearate, PEG-100 Stearate, Helianthus Annuus (Sunflower) See Oil, Kigelia Africana Fruit Extract, Sclerocarya Birrea Seed Oil, Salicylic Acid, Water (Aqua), Ascorbic Acid, Tocopheryl Acetate, Retinyl Palmitate, Butylene Glycol, Fragrance (Parfum).